Andrew Mitchell signs a pre-contract agreement to join Glenavon this summer from Dungannon Swifts. Also included is Glenavon manager Gary Hamilton. Pic by Pacemaker Press/Alan Weir. Andrew Mitchell will return to his former club this summer with “unfinished business” in Glenavon colours. That was the view of Lurgan Blues boss Gary Hamilton following last night’s confirmation of a pre-contract deal to bring Mitchell back to Mourneview Park from Dungannon Swifts at the end of the season on a three-year contract. Mitchell left Glenavon in 2014 in pursuit of regular first-time football and currently holds top spot in the Danske Bank Premiership scoring charts on 19 goals for the Swifts. Hamilton has described Mitchell’s love for the club as an “ace in the pack” to help Glenavon secure the striker’s signature over defending champions Crusaders and title-chasing Linfield. 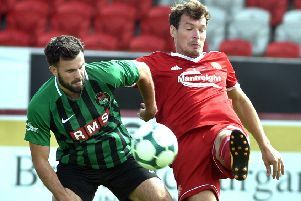 “We cannot compete with those clubs in terms of wages but Andrew’s connection to Glenavon was an ace in the pack,” said Hamilton. “He has unfinished business here after leaving in search of regular football to help his development. “We offered Andy a fresh contract at the time but always respected the reasoning behind his choice to move on. “We are friends outside of football and I am just delighted to have him at Glenavon from next season. “It is a massive coup for Glenavon and Andy is that out-and-out scorer we feel can really add something special to the squad. Mitchell told the official Glenavon website of his desire to “continue to do the best I can for the Swifts” until the end of the season but described a move back to Lurgan as “an absolute dream” and how his “granddad and dad have supported Glenavon for many years”, plus confirmed a desire to help the club challenge and “bring silverware to Mourneview Park”.